Dial-A-Nerd thanks all of our wonderful friends for helping us. Without their support it would not be possible for us to be where we are today. See Tom for Personalized Tax Preparation and Financial Management Services for Individuals and Small Businesses. His Initial Consultation is free. The Fabulous Hubcaps is one of the nation’s most sought after oldies and classic rock show bands. Their career has been as diverse and colorful as the bowling shirts they wear. On any given month, their schedule may take them from Miami to Pittsburgh, Atlanta to Detroit, or Albany to Washington, DC. Inducted into The Southern Legends Entertainment and Performing Arts Hall of Fame in 2005, The Fabulous Hubcaps have been the choice of entertainment for decades. Dial A Nerd is a local MD small business specializing in PC repair, computer repair, laptop repair, network configuration and repair, Windows XP repair, Windows Vista repair, Linux server support, web site development, Virus removal, and more. 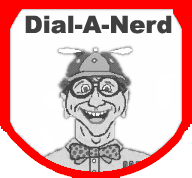 Dial-A-Nerd is available 24 hours a day 7 days a week. DialANerd provides immediate remote access service as well as fixed price service charges for drop off and pick up service at our repair shop with typical 24-hour to 48-hour repair completion. The Dial A Nerd goal is to save your data. We test your disk for errors every time we do service and we save disk data in about a 90% of the PCs we service. Dial A Nerd is a local Columbia Howard County repair business that gives you faster service and better customer support than any Geeks for other franchise PC repair companies. Contact us for your business service solution. Dial A Nerd works on all types of PCs including Sony, Gateway, Hewlett Packard, Compaq, Toshiba, Emachines, Clone PCs, and Dell computers in Columbia, Ellicott City, Howard County and many other Maryland locations. The Dial A Nerd mission is providing the best quality, affordable cost effective computer repair, home PC support, training, virus removal, printer support, SOHO network - wireless network setup, web site design, promotion, and optimization services to any home or any small business operating with limited IT services and IT support budget.